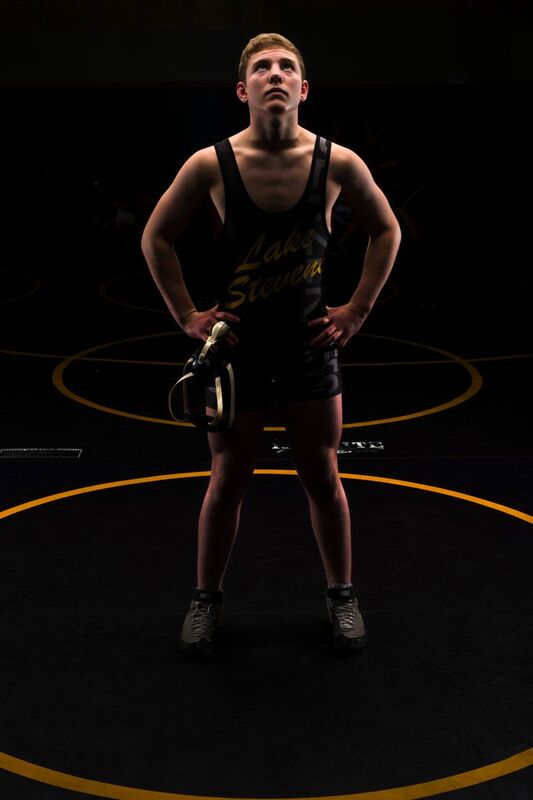 Lake Stevens wrestler Michael Soler truly has grown up this season and will wrestle at 170 pounds this season after winning 4A state titles at 132 as a junior, at 113 as a sophomore and at 106 as a freshman. LAKE STEVENS – When Lake Stevens’ Michael Soler stepped onto center stage at last season’s Mat Classic final at 132 pounds in Class 4A, his appearance was that of a boy facing a man. It was the boyish-looking Soler, then a two-time state champion, pitted against mustachioed Pasco senior Timmy Martinez, another two-time champ. It was then that the boy truly emerged as a man on the wrestling mat. He scored a hard-earned 5-4 decision. The Hornets return four state placers, including junior Jake Treece, a state runner-up at 126 pounds in Class 3A, from last season’s 3A state-championship team. Enumclaw, led by coach Adam Eilers, edged North Central of Spokane 110-108½ in last season’s team race at Mat Classic for the school’s fifth state title. The Bears return three state placers, led by junior Justin Sipila (3rd at 126 pounds), from last season’s ninth-place team at Class 4A state. Nick Whitehead (5th at 120) and Ryden Fu (5th at 138) are back after positive state experiences and Tahoma mixes in some improving talent to make it a formidable squad. The 10-time state-champion Vikings return three state placers, led by three-time individual title winner Michael Soler, and should get growth from seven underclassmen this season. Could this be the year the Eagles soar to the top of Class 3A under coach Rick Iversen? The pieces certainly seem in place for a state-title run for Arlington with five state placers back in the lineup from a team that took sixth place last season. The Conquerors return four state participants from last season’s 20th-place state team. Leading the way are seniors Sidney Suit (100), Sara Mozeleski (seventh at 135), Anna Watson (seventh at 140) and sophomore Sabrina Perez (sixth at 170). Perez is ranked No. 1 at 170 by washingtonwrestlingreport.net. Now, Soler, a senior for the Vikings wrestling team, is presented an opportunity this season to join the elite club of four-time state champions in Washington. There are currently only 12 other boys with four crowns under their belts. Soler, now 5 feet 11, 170 pounds, grew more than five inches and gained 48 pounds during the offseason, and his plans are to wrestle at 170 pounds in his pursuit of history. “Over the summer, he just sprouted,” said fellow Viking Jake Douglas, the team’s 145-pounder and Soler’s good friend. Soler, off to a 10-0 start with six pins, appears to be more aggressive and decisive this season. “It feels good going up (in weight) and I’m not cutting so much weight as I have in the past,” Soler said. “I grew a lot this summer. I’m going out there pretty much wrestling the same style. There’s just a little bigger kids, and I’m quicker than them. Soler’s confidence showed in Thursday’s showdown of Class 4A powers between his Vikings and Tahoma. He cut loose his opponent, Gage Dress-Moran, three times in an attempt to find a weakness. Soler scored a pin in 1:36 with furious attack after attack. The competition might be able to rest easy after high school as Soler’s main focus is to become a doctor. Soler is part of the Running Start program to earn college credits while in high school. Soler truly has grown up this season and will wrestle at 170 pounds this season after winning 4A state titles at 132 as a junior, at 113 as a sophomore and at 106 as a freshman. The Royals’ talented wide receiver in football doubles as a demon on the wrestling mat. Daigbe, who started wrestling in seventh grade, has blossomed each season and captured the 182-pound class in 4A as a junior. After three seasons as a state placer at Juanita, McDaniel’s family moved and he joined the Warriors’ program and plans on more state success. The transfer took second at 170 pounds in 3A as a junior. The Vikings’ leader has a chance to become just the second girl to win four state titles in the state of Washington. It’s clear the hunger burns to accomplish the rare four-peat for the 125-pounder, who captured the 120 title as a junior and 118 titles as a sophomore and freshman. If Pleasants can stay healthy, she has a big chance to bring home another state title for the Raiders. She suffered a late-season injury last season that kept her from wrestling at state after winning the 112-pound class in 4A as a freshman. Soler, who owns a 3.9 GPA, just got an A-minus in one of those college classes – political science — and it didn’t sit well with him. “I didn’t get a B, but I didn’t get an A,” Soler said, shaking his head. For Soler, it’s not about piling up the medals and trophies. It’s about doing his best and giving his best. In fact, Soler doesn’t display his medals in his bedroom and says his father, Al, has all of those trophies and medals. Barnes thinks Soler’s humility serves him well in the chase.